I have loved it here in England, but I am so happy to go home. I have missed my family’s home cooked meals. And our junk food! England’s junk food is healthier than ours. It isn’t as greasy and as yummy. I want New York pizza and bagels and our sweet chocolate! It isn’t just the food that I have missed. I have obviously missed my family, but I just saw them a little bit ago, so I’m still excited to see them, but not as excited as I would have been if I didn’t see them during Thanksgiving. But I am so excited to see my cat. I have missed animal affection so much. I will be hanging out with my cat the entire day I land. I will play with her and hold her even if she doesn’t want it. My room is another thing that I have missed deeply. I miss my bed. Being able to take a nice shower once I get home will be amazing. The shower here is very small and can have its good and bad days. But even though there are things that I make me wish these last days to pass by quicker, there are a lot of things that I will miss. I will miss being only twenty minutes from London and having the ability to just pop into Central for a day and come back. I will miss being forced to exercise and walk places to get food or to do something that I want to do. I will miss walking down the street and seeing all the houses right next to each other and thinking, this is just like the movies depicted it. No humidity has been great and my curly hair is not ready to go back where it is humid every other day. The weather has been very nice while I’ve been here. It has been low forties yet it hasn’t felt that cold. I will probably get to New York and be very cold, but I am enjoying not having to bundle up so much here. And the museums in London! There are so many that I have gone to, yet I haven’t been to nearly half of them. I will definitely come back to London, but for vacation. I have enjoyed living in a city that is bigger than New Paltz, but I can only live in a big city for so long. I like the small town vibe. 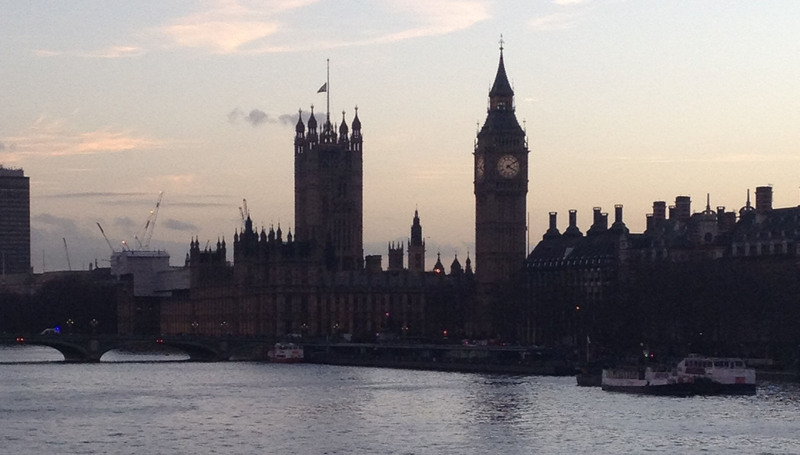 London has been a great experience, but I am happy to be going back to a small town. I will be back London—and Florence, and Rome, and Dublin, and Galway, and Munich, and Bruges. Let us begin the beguine! As with all beginnings, introductions are in order. My name is Patrick Kiernan, and I am a theatre arts major at SUNY New Paltz. As such, I love theatre and performance in every form that it could possibly come in. I am a sophomore, member of the New Paltz Players, Paper Rain Laboratory Theatre, and most recently Alphi Psi Omega, the national theatre honor society. That seems to be quite enough introductions, so now to the marvelous and fantastic trip to London, which I am eagerly awaiting. As of now my suitcase stands half-opened in my room, things tossed semi-carelessly inside. Even as I write this, I am dreading zero hour: “Packing Time”. It is probably the lazy person in me speaking, but I’m confident I’ll drag myself into getting it done. Speaking of dragging myself to getting it done, I should probably do that now. Til next time. Here goes nothing!